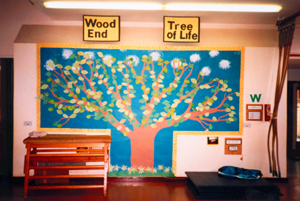 This is known as the tree of life and was made to commemorate 25 years of Wood End School and surrounding area. On each leaf there is a comment made by the pupils about the School. Street party celebrating the wedding of Charles and Diana. June 29th 1981, held at Westhill, Stantonbury. Maypole dancing at the School Summer fete.